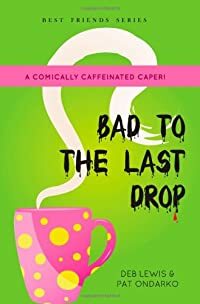 Bad to the Last Drop by Deb Lewis and Pat Ondarko, a Mysterious Review. Review: Best friends Deb Lewis (a lawyer) and Pat Ondarko (a pastor) together pen their first "best friends" mystery featuring Ashland residents Deb Linberg (a lawyer) and Pat Kerry (a pastor) in Bad to the Last Drop, a cozy set along the northern Wisconsin shores of Lake Superior. The gathering spot in Ashland is the local coffeeshop, the Black Cat. Pat and Deb and regulars as is Joe Abramov, a Vietnam War veteran who seemed to live in another world, one filled with contacts at the CIA and lottery winnings. But when Joe doesn't show up for 4 days, the Black Cat barista calls the police, who find him dead in his apartment. There is no sign of forced entry, no unusual wounds on the body — a seemingly natural death. But an autopsy reveals poison in his system giving Pat and Deb an opportunity to play the role of amateur sleuth and solve the mystery of who might have wanted this much beloved, colorful character dead. The narrative in Bad to the Last Drop is casual, conversational even, not unlike a leisurely visit to a local coffeeshop to enjoy in a cup of Italian roast and catch up with friends and neighbors. It is, however, also somewhat uneven, with frequent backstories that don't necessarily add anything to the story, and a non-linear chronology with passages that start with "Several weeks prior to that morning ..." and "Earlier that evening ..." And though Pat and Deb are the principal characters, several others occasionally share the point-of-view, popping up unexpectedly in the conversation. It's all a bit disjointed. Acknowledgment: Langdon Street Press provided an ARC of Bad to the Last Drop for this review.